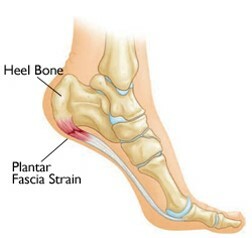 Plantar fasciitis causes pain in the bottom of the heel. The plantar fascia is a thin ligament that connects your heel to the front of your foot. It supports the arch of your foot and acts like a shock absorber to help you walk. Too much pressure on your feet can damage or tear this ligament. The plantar fascia becomes inflamed, and the inflammation causes heel pain and stiffness. The major complaint of those with plantar fasciitis is pain and stiffness in the bottom of the heel on the inside, although some experience pain at the bottom mid-foot area. It usually affects just one foot, but it can affect both feet. It is usually worse in the morning when you take your first steps, or if you’ve been sitting or lying down for a while. Climbing stairs can be very difficult due to heel stiffness. You’re at a greater risk of developing plantar fasciitis if you’re overweight or obese due to the increased pressure on your plantar fascia ligaments. Women who are pregnant may experience bouts of plantar fasciitis. Certain high impact sports or if your occupation involves a lot of standing may increase the risk of suffering with plantar fasciitis. The condition is common in middle aged people and is slightly more common in females. Another risk factor is arch disorders of the foot. It is though that an excessive inward rolling (pronation) and/or rapid speed of this movement can cause small micro tears of the ligament and result in inflammation at points where the ligament inserts to bone. Reducing inflammation in the plantar fascia ligament is an important part of treatment, but this doesn’t address the underlying damage to the ligament. At David Brown Podiatry, we aim to reduce the inflammation and treat the actual cause of the pain. If the cause of the pain is not addressed then it is likely that the pain will reappear in future. A common cause of this pain may be flat feet (fallen arches), high arched feet and/or heels that are misaligned. An orthotic insole may be necessary to address these issues. In these situations a biomechanical assessment is advised to pin point any structural improvements that need to be made and to find the right orthotic to suit your needs. We have a wide range of custom made insoles that can be made and fitted to your footwear on the day of your assessment.